This comprehensive app empowers the law-abiding CCW (concealed or open carry permit) holder (or anyone who wants to lawfully transport a firearm in any state.) It gives you direct information needed to follow the maze of arcane, complicated, and dissimilar gun laws in each state and in each situation. Easy-to-use User Interface and Laws & reciprocity updated monthly or more frequently! Join the 200,000+ people who have already downloaded the #1 gun reference app on Apple App Store! Key Features: -Instant updates downloaded to your device with the laws change! Auto-update now available! 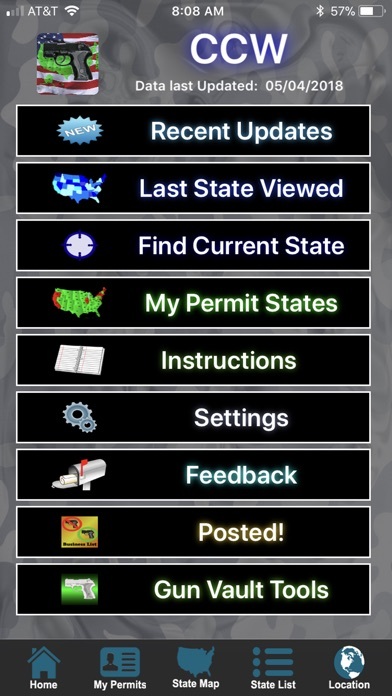 -Individual laws for each state and U.S. territory stored on your phone -Updates reciprocity information for each license. -State Laws in each category (Transporting Firearms w/o license, Places Off-Limits for license-holders, State Preemption, Duty to Inform, "No Guns" signs Force of Law, New / Renewal Licenses, Open Carry, Parking Lot Storage, Magazine & Tactical Rifles, Use of Force & Duty to Retreat, Restaurants Serving Alcohol, Roadside Rest Areas, State & National Parks, State & National Forests, Wildlife Management Areas) -Includes Federal Laws, airplane/train, and Indian Tribal Laws -Save your licenses / permit info -Contact directory of state officials -All information available offline (no active internet connection needed) -Find laws based on GPS (as well as local points of interest) App comes with a free two-year subscription to all law and reciprocity updates. Additional subscription available at only $.99/ year. Auto-renew (charged to iTunes 24 hours before end of subscription) is optional. Convenient map to plan your next vacation or interstate-travel to avoid where you cannot carry. 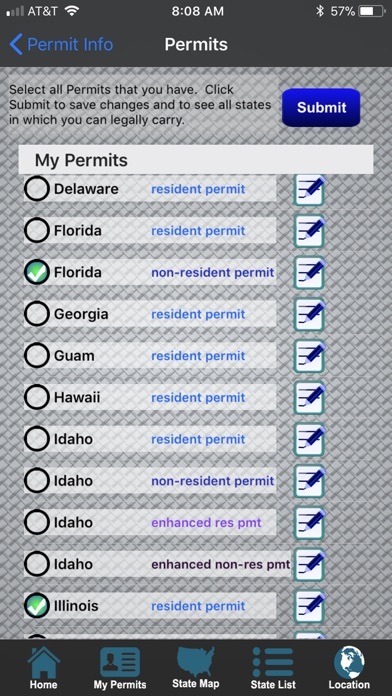 Save your current license or permits (both Resident and Non-Resident) to see which states recognize YOUR permits. This application puts the power in your hands. Access and review the relevant firearm laws and gun prohibitions for every state. Examine the actual gun laws, instead of relying on someone else's interpretation. 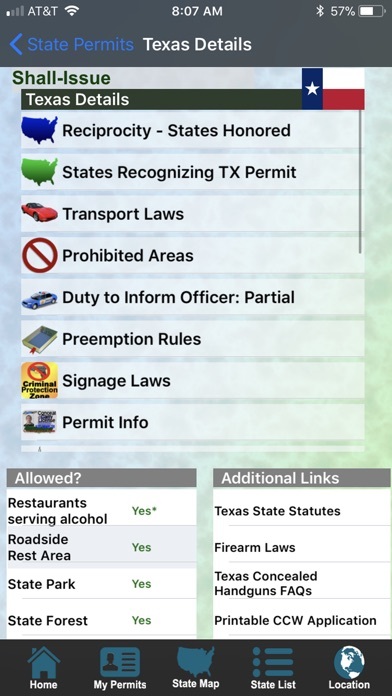 Find the prohibited locations, transportation rules, permit process, & more for every state! Also provides direct links to the laws themselves on the government websites, so you can research any open questions. It includes the pertinent federal laws. For specific locations (such as restaurants serving alcohol), see the quick allowed status, then click for details and laws. Also includes "duty to notify" laws for each state (when available) for contact with a police officer, such as a traffic stop. Instant frequent updates to the firearm laws! When new or modified laws are available, it prompts you to download the latest (usually takes only a few seconds). These changes stay with the app and are available offline once downloaded! Auto-update option available. 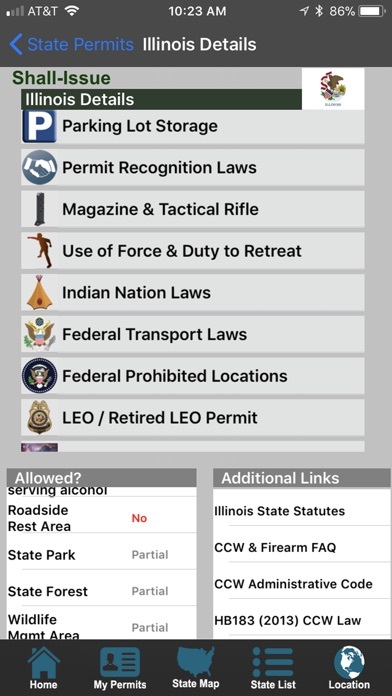 Compiled list of links to review information directly from the state governments & law enforcement authorities: State Statutes for each state, direct Reciprocity Information, CCW Application forms, State FAQs, & more. 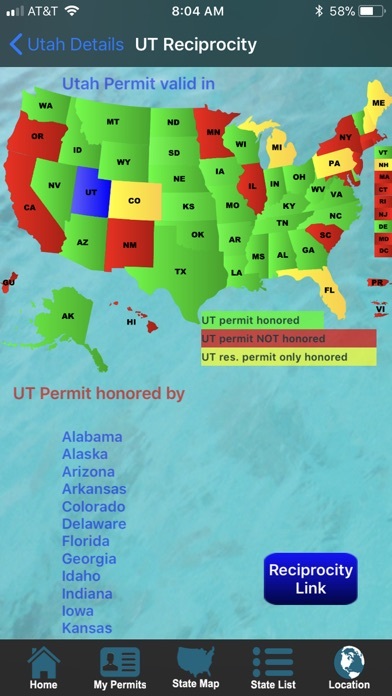 Interactive state maps show any scenario: All states recognizing a specific permit, all permits that a specific state allows, type of permit available, map of states recognizing your permits. 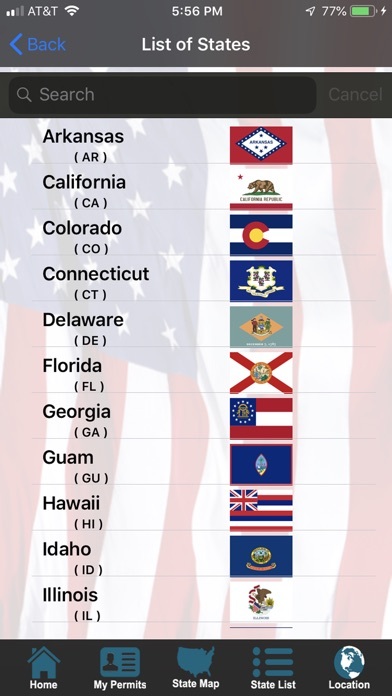 Click on any state to see the detailed laws! Find and contact (one touch dialing, map to office, email, and URL) local authorities in each state. Ability to customize and save your preferences (background pictures, high contrast / colorblind, etc...). Disclaimer: If unsure about legality of carrying or transporting in specific location or situation, contact local law enforcement or legal counsel. Laws change frequently and are subject to interpretation. This application implies no warranty and does not constitute legal advice. By using this app, you agree to hold the app authors and owners harmless and without liability. You are responsible for abiding by all laws (official versions held by each state). Please see full Disclaimer on Developer Website. I travel all over the United States for work. This app is incredible. Very up to date, and very user friendly. 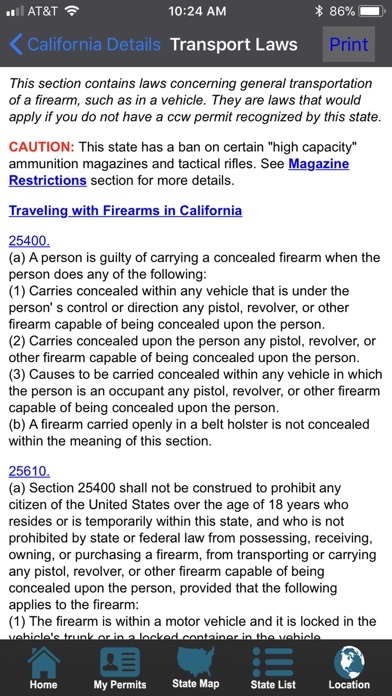 I would, and have, recommend it to anyone looking to travel that carries their firearms with them. Very good and handy reference! It’s the best to be informed on rules of each state and be aware of my legal issues on every state. This is the best CCW resource available. 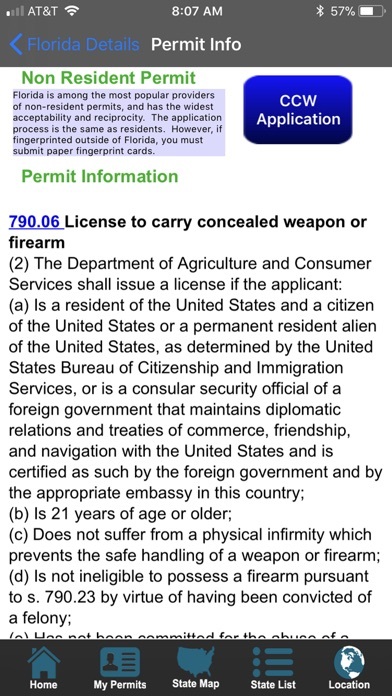 I have been using this CCW application for ten or more years and never found it lacking. Traveling? You need this app. One of the few keepers I have on my phone. Yeah, it’s now subscription based but keeping fifty states laws current is not a task I would want to do, I can handle a buck a year subscription.